HANA Studios DB restore option and hdbuserstore there after makes the whole process of a System copy a lot simpler . The only limitation would be that the target schema would still remain as source. The idea of this blog is to explain the process of performing a simple homogeneous system copy of a HANA based system using the recovery of the source backup on the target HANA DB using HANA Studio. Step 6) Modify the default key using the hdbuserstore on the application servers and DB instance. Step 8 ) Post activities. Step 1 - Backup of the source DB . Use the HANA studio backup studio to take a complete DB backup either at the disk level or using Backint. Usually this should be sufficient to perform a DB Refresh but if you are looking for a point in time recovery you may want the backups from the log area as well to include them post the recovery. → Open HANA Studio and right click on the SID ( target) where you want to perform the recovery. You will have to specify the destination location and the Backup Prefix for the HANA studio to recognize the backups . 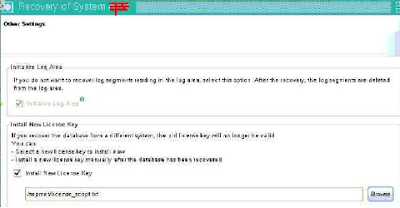 Complete data backup and not planning to recover log segments you can select the option “ Initialize Log area”... This is something like reset logs in oracle. Post recovery your existing HANA License will be invalid , so here is a opportunity to mention the license text so that that can be installed automatically. If not this can be performed manually later. Proceed with the recovery . Please note that the Target and source version must have the same configuration. Is there are specific configuration thats required in the target system that can be done manually as part of the Post steps. 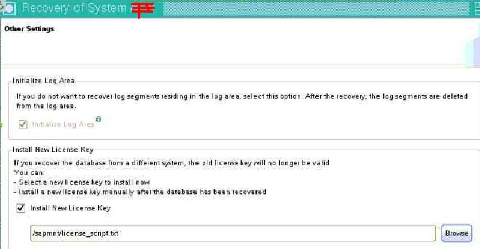 Post recovery you should be able to see the Overview tab in HANA Studio with the Memory and Host Details. However you may expect to see all the schemas under Catalog but it will error out as below. Same would occur when you try to expand Content. Step 6) Modify the default key hdbuserstore on the application servers and the DB instance. Let say for example our target host is : host01 and Source SID is PRD and System No : 00 and lets assume that the source schema is SAPPRD and its password is sapprd#! hdbuserstore set default host01:30015 SAPPRD sapprd#! This confirms that the key is set . This has to be done on the appservers , else R3trans -d would fail. Go back to HANA Studio and you should be able to see the contents under Catalog and Contents. You should also find the source Schema under Catalog. At this point there is one more thing that needs to be done before we start the apps on the target system. go to the DEFAULT profiles and modify the /dbs/hdb/schema to SAPPRD ( or whatever your source schema is ) . At this point you are good to start SAP. Follow the standard Post Refresh activities from there..
- > Perform standard post steps like SE06/STMS/BDLS etc and activities specific to your case.